Lee Baby Sims, curator of this really unique event, gives a very articulate introduction about how, ostensibly, the thread that ties everything together today is memory. He shared parts of his personal collection of art and postcards from trips to Central and Eastern Europe, and vibrates with enthusiasm when he recounts his experiences in Slovakia and the Czech Republic. It’s an inspiring start to an incredibly immersive day. Diskotek Archives provided an exhibition of 1960’s/70’s period piece Socialist Modernist postcards from behind the Berlin Wall; a photographic peak through the Iron Curtain. It’s as interesting and idiosyncratic as you’d expect, a beautiful documentation of aspects of life in Central and Eastern Europe. 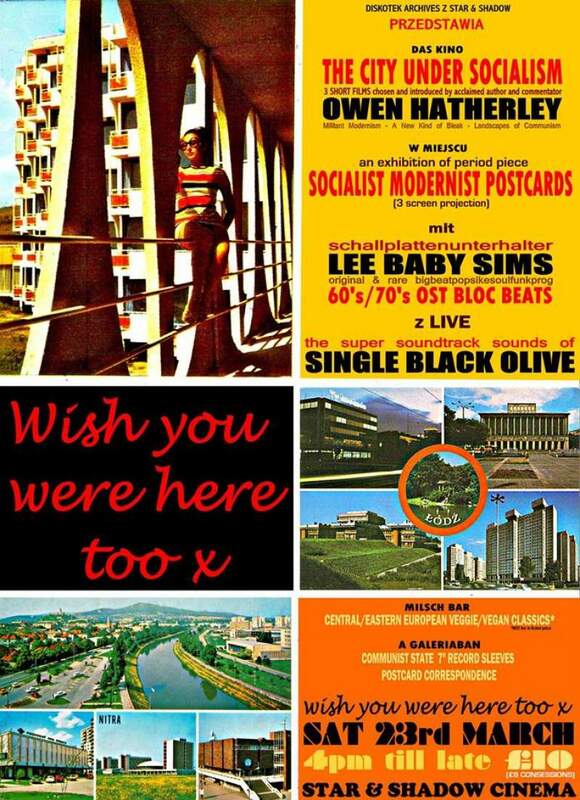 Having Owen Hatherley present three short films exemplifying the ideal socialist city seems like something of a coup; Hatherley is widely regarded as being one of the leading authorities on architecture and psychogeography. He’s a warm, funny, humble, engaging presence, and his choice of films is incredibly incisive, not overtly political but perfectly capturing the social and political moods of Ukraine, Lithuania and Russia in the 20s, 60s and 1970S respectively. The attention to detail here is also second to none; from the presentation of the collection on three projectors for a truly immersive experience to the delicious goulash served by the S&S kitchen, Wish You Were Here Too is clearly a real labour of love. The exhibition is designed to emulate Klub Bardzo, Warszawa, with the aforementioned Sims playing some of the rarest and best 60’s/70’s rock, prog and funk records from the DDR, Poland, Czechoslovakia, Hungary, Yugoslavia, and Romania. We are also treated to sets from Single Black Olive, their suave, melodic rock music fitting perfectly with the aesthetics and vibe of the event. Wish You Were Here Too provided a real out of the ordinary experience, and should be commended for bringing a really fantastic collection of cultural artefacts together to be enjoyed in this context.